So we had family with us to celebrate, and I was much more relaxed, and enjoyed the meal 🙂 I hope that’s how your day turned out, as well. So now, here we are, staring down the calendar to the end of 2016! They say that nothing is more constant than change; and one of the big changes coming up with Stampin’ Up! of course is the end of the Holiday catalogue, and the start of the new Occasions Catalogue, and Sale-A-Bration! You’ll be able to order from them on January 4th, 2017. There are SO many awesome new stamp sets, thinlits/framelits, embellishments, designer series paper – and watercolour pencils!! 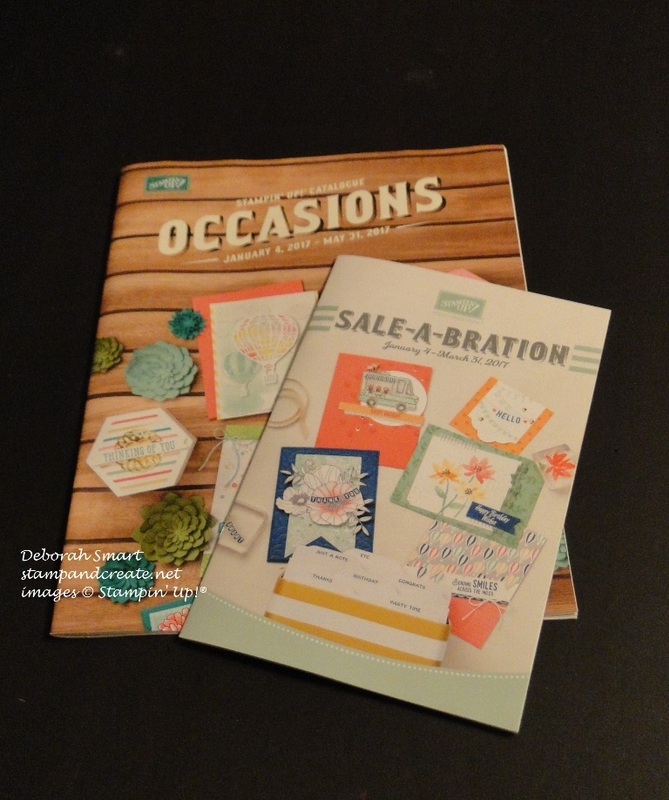 Not to mention the fabulous FREE items in the Sale-A-Bration brochure; a lot of them coordinate with new products in the Occasions catalogue! If you live in Canada, and don’t already have a demonstrator, contact me to get your copy of the catalogues! But before we get too far ahead our ourselves – there’s still time to order from the YEAR END CLOSEOUT SALE! Loads of great deals to be had on retiring products – up to 60% off! Just click below to go to my online store, and get your order in before January 3rd. Right now, I’m working on projects for 2 upcoming Blog Hops – the first will be on Dec. 30th, with Janet Wakeland, and will be an ‘Out with the Old, in with the New’ theme; the second one will be on January 1st with the Blogging Friends, and we’ll be featuring all new products! So stay tuned – be sure to come back & see the goodies! I’ll be sharing more before then, too.